Last winter in the Bahamas we spent months at a time anchored out and not connected to shore power. We also learned we like our cold refrigerator (cold beer) and our colder freezer (steaks from the USA) and unlimited computer usage. All these things take power and lots of it. We do not apologize for it. We still use less than a 10th of what we did when we lived ashore! Magnolia has been equipped with a 90 amp alternator on the main engine and the diesel generator is tied to our 100 amp charger. We have multiple means to generate electricity, but they all require running a diesel engine. The fuel consumption is reasonable and the engine wear and tear is minimal and no matter the already installed equipment needs to be utilized. Magnolia consumes between 160-200 a/hrs per day. We need to run our generator to make hot water and run the vacuum so we do not mind running the generator for an hour in the morning. Running the generator fulfills between 70-90 of the a/hrs Magnolia requires, the other 110 –130 had been fulfilled by a second running of the generator in the evening. The goal is now to avoid the second generator run in the evening by installing solar panels (a set of panels with 200 amp and a set of 24o amps totally 440 amps). The consideration was where and how to mount panels. Many people add additional stainless tubing structure above their cockpit enclosure or onto the dinghy davits. We really did not know what we wanted because neither prospect was overly appealing from a additional weight or cost aspect. We eventually settled on a lightweight Sunbrella canvas system that would allow us to reconfigure the panels to take maximum advantage of the sun as it moved across the sky. With the initial design complete it was time to assemble the pieces. First we needed a charge controller. We settled on an Outback 60 controller because 1) a friend has it and has had good results and 2) it is the one our electrician normally installs in case Anthony got in over his head. 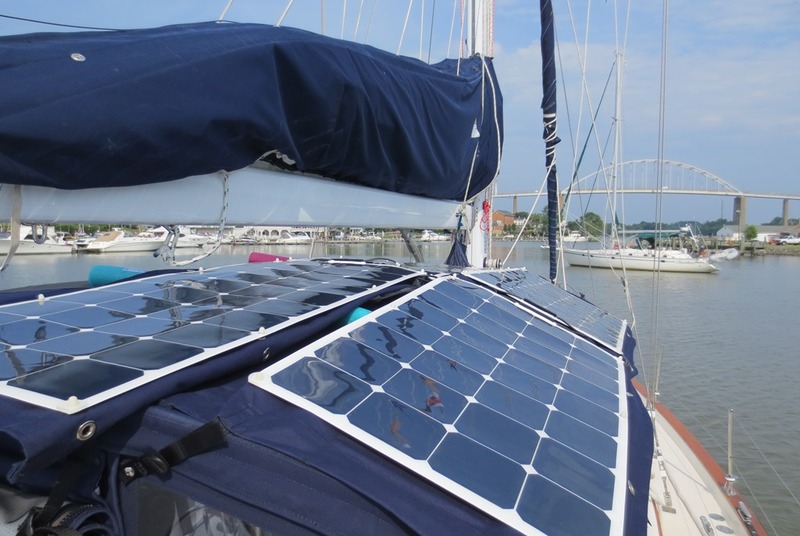 Based on a recommendation from JR & Drena aboard SV Journey, we turned to Discount Solar which is an Ebay store for the four panels. We also purchased MC4 cables from Solar and Wind Pro also an Ebay store. With the pieces in hand the first thing was to fabricate the Sunbrella canvas mounting. 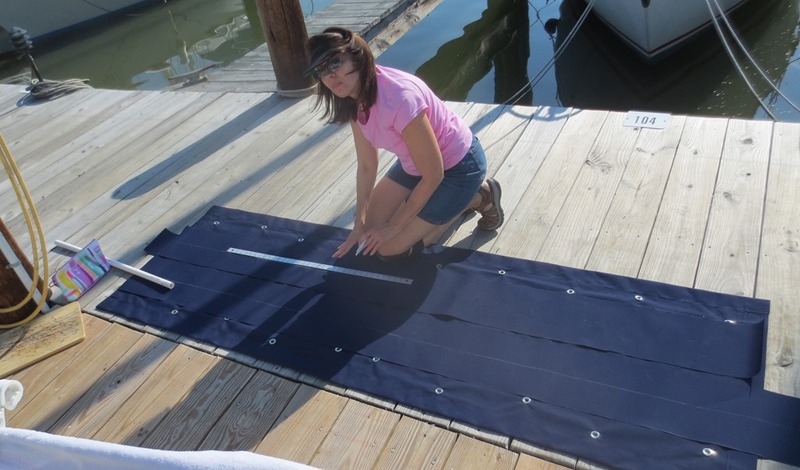 The Admiral was kind enough to cut and hem a panel about 4 inches wider and 8 inches longer than two panels laid end to end. The panels are semi flexible and are mounted on a grommeted base. We installed grommets on our Sunbrella base and used nylon bolts, washers and acorn nuts to attach the two together. 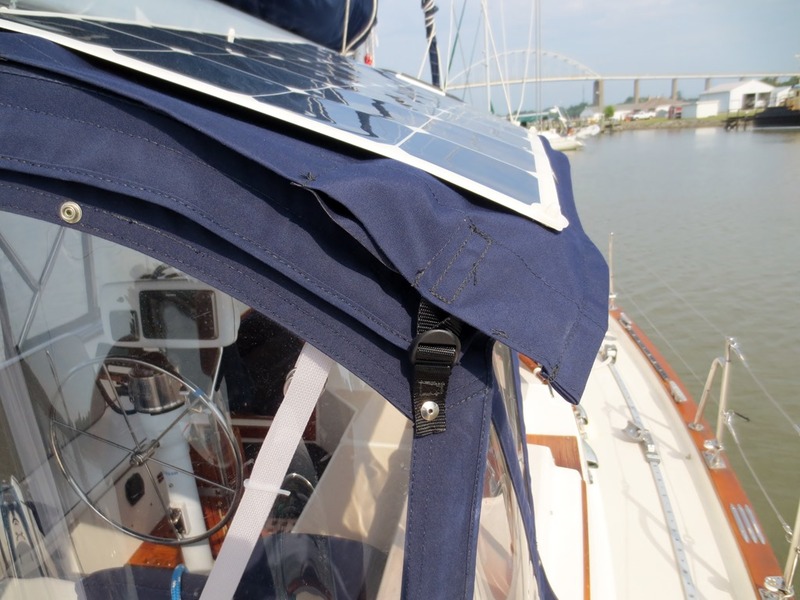 We installed additional grommets so we could use line to tie the panels down in addition to web straps with snaps as each end. Our enclosure has snaps available to snap right down onto. We also added a casing so that two 1 inch rods could be inserted into the panel so provide additional rigidity. We are currently using 3/4 inch PVC pipe, but I am having 3/4 inch tent posts fabricated for the final design. The Admiral actually provides a better description of the canvas base on her blog “Seamless Sailor”. Here the panels are installed and being used. It is not our plan to keep the panels installed on the enclosure underway. We really only need them the second and additional days we are at an anchorage. They fold right up so two panels are facing each other and store in the V berth in 2-3 minutes as we prepare to get underway. Two of the panels are connected together using a MC4 Y connectors. Each “set” of panels is fed into a Blue Seas – circuit fuse block with ground bus. This essentially connects all the panels together before being fed into the Outback controller. 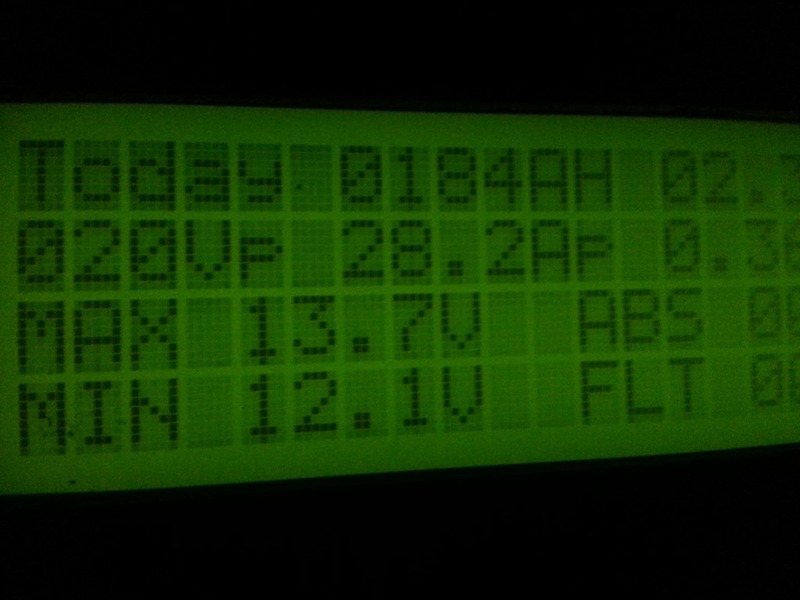 The Outback controller is then connected to the battery bank through a 5o amp cube fuse. As can be seen below we generated 184 Amp Hours on this particular day. That would cover our total daily usage! That looks like a great solution to the problem of mounting flexible panels and good output, too! This is too cool, I need to read more of your blog. Hope all is well, let me know if you’ll be in the Miami area once the tropics cool down!